Sean Connery went to work on a milk delivery truck when he was nine, in the depths of the Depression. He dropped out of school at 13 to work full time, and joined the Navy at 15, where he served aboard the HMS Formidable. In his late teens and early 20s, Connery supported himself as a model and with other odd jobs, including a stint as a mortician's assistant. He made his professional stage debut in the chorus of the London production of South Pacific in 1951, and his film debut in a tiny, uncredited role in 1955, in Errol Flynn's Lilacs in the Spring. Connery came to moderate fame with a 1957 live telecast of Requiem for A Heavyweight, with Michael Caine. He got the role only when Jack Palance backed out, perilously near the scheduled broadcast date. The show's producer was unsure about hiring him, but decided to gamble on the near-novice actor when several women on the set whispered that they found Connery attractive. Two years later he was offered two breakthrough roles -- king of the apes in the next Tarzan movie, or a tuxedo-clad spy in Dr. No. Connery said no to Tarzan and yes to No. 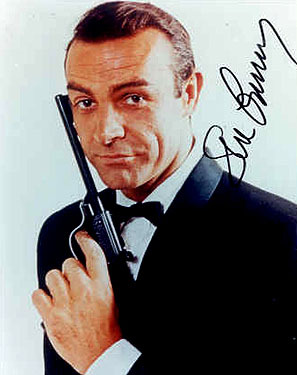 Dr. No spawned sequel after sequel, and Connery played the spy seven times, with an appealing blend of surface sophistication and subdued savagery. Feeling typecast and undercompensated, Connery eventually walked away from the part. Connery wasn't the first to play Bond -- Barry Nelson had the role in a 1954 television version -- but he was the movies' first James Bond, and is still generally acknowledged as the best. He has had great success in other roles, but even decades later, Connery and Bond remain indelibly linked in the public's mind. He was named People's Sexiest Man Alive in 1989, when he was 59, and Sexiest Man of the Century ten years later. In 2005, Connery was sued for $30 million by downstairs neighbors in his Manhattan condominium, alleging that years of renovations to his palatial unit had lowered the value of their palatial unit. The suit also alleged that when the neighbors' daughter knocked on Connery's door, asking him to stop the "loud music at all hours and stomping about", the actor's "appearance and behavior was that of a rude, foul-mouthed, fat old man... Cursing and otherwise using indecent language, Connery demeaned [his neighbor], refused to lower the noise and slammed the door in her face". With an especially bad case of male pattern baldness, Connery began losing his hair at the age of 21. Without his toupee, he has been thoroughly bald for decades, except for a small ring of now-gray and thin hair above his ears. Politically, Connery is a longtime supporter of Scottish independence.